As most of you know, I’m not a big baker. I only do it when forced, and I tend to rely on the same old recipes over and over and over…and over. 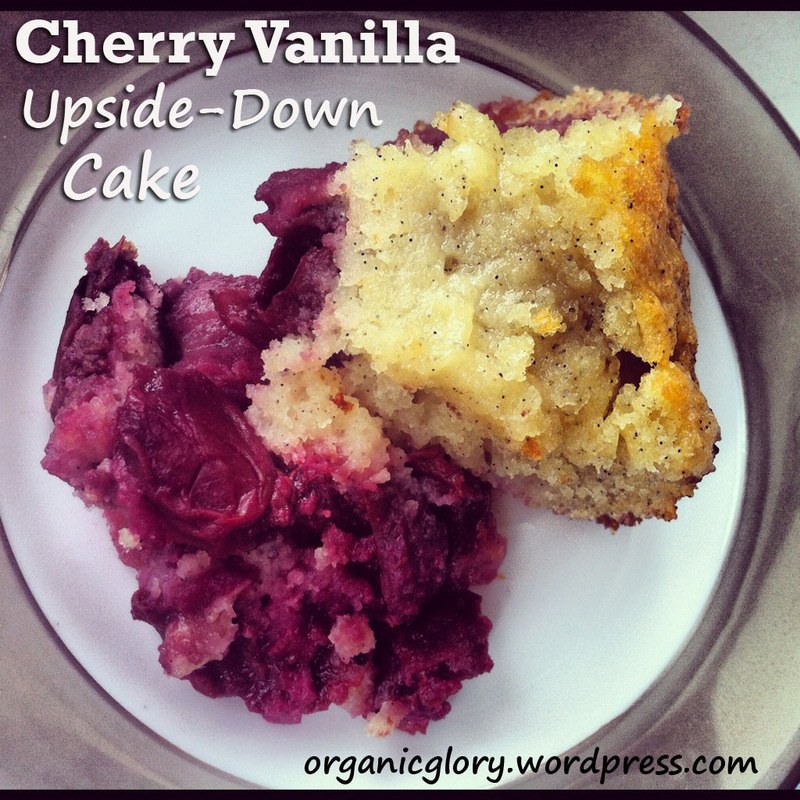 So I really love an easy crowd-pleasing recipe, like this Vanilla Bean Cake baked upside down with cherries in the bottom of the pan. It’s simple, fast, and tasty: just my style. How fun would this be for the Fourth of July or any other summer cookout? Tastes amazing with ice cream. 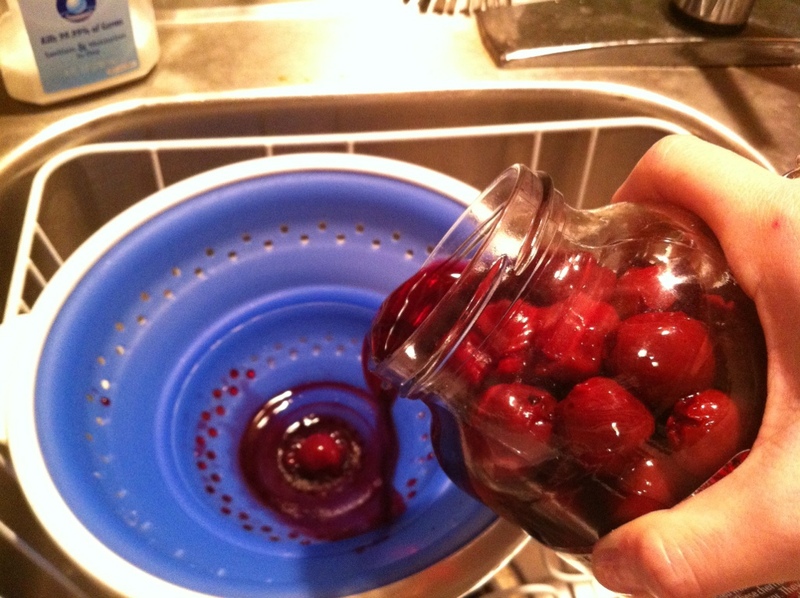 Drain the jar of cherries into a small bowl, reserving all the cherry juice for drizzling later. Set the bowl of cherries aside. 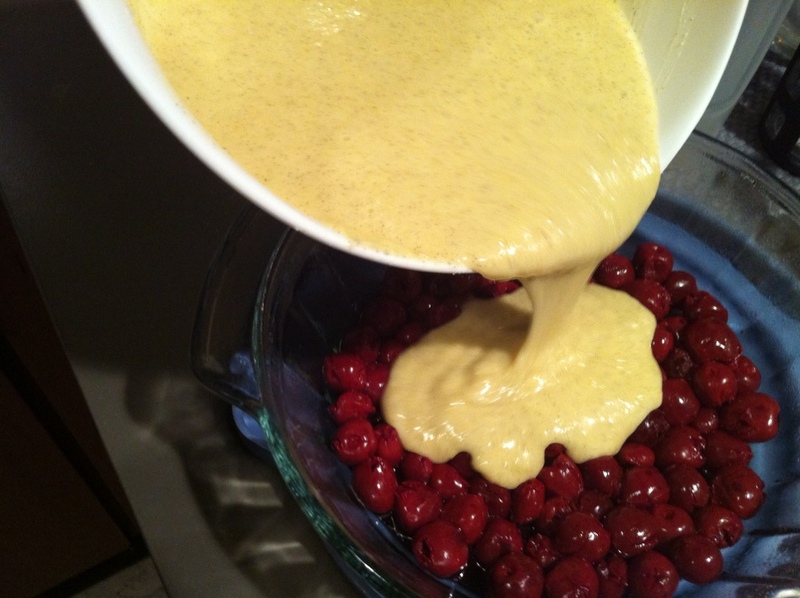 Meanwhile, mix the batter: melt the stick of butter and combine with the two beaten eggs. 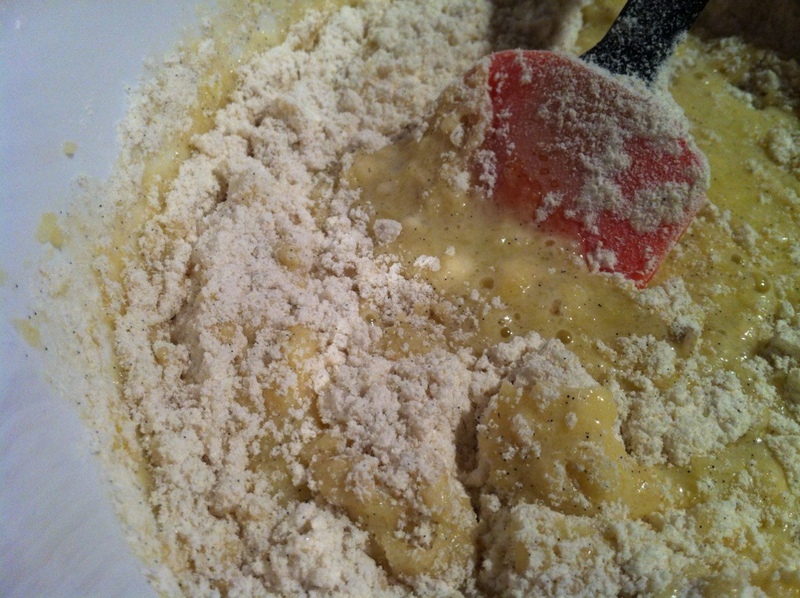 Stir, then add the dry mix, turning by hand until just combined and lumps are gone. 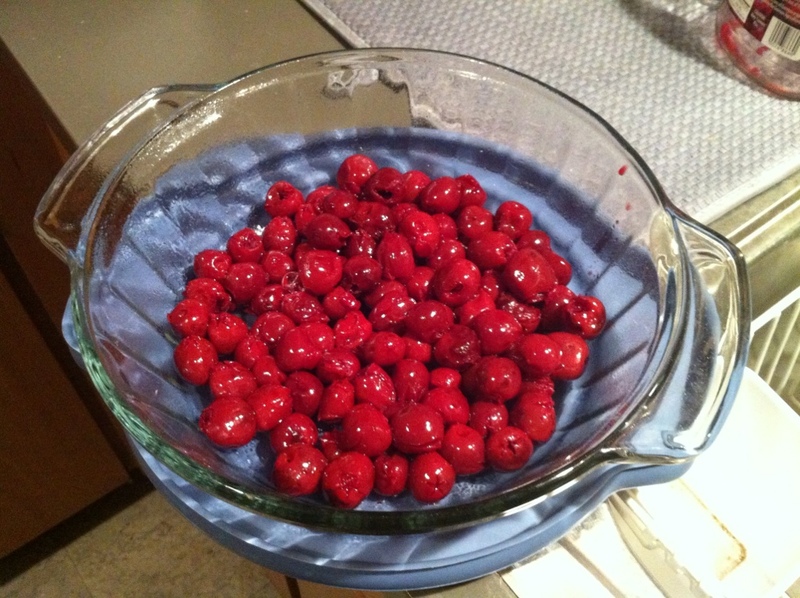 Pour the cherries into the bottom of a square glass baking dish. Pour the batter on top. Bake at 350 for 45 minutes to one hour in a glass baking dish (mine took a bit longer, but that’s how my oven is). It’s ready when the center is set and a knife or toothpick inserted in the middle comes out clean. 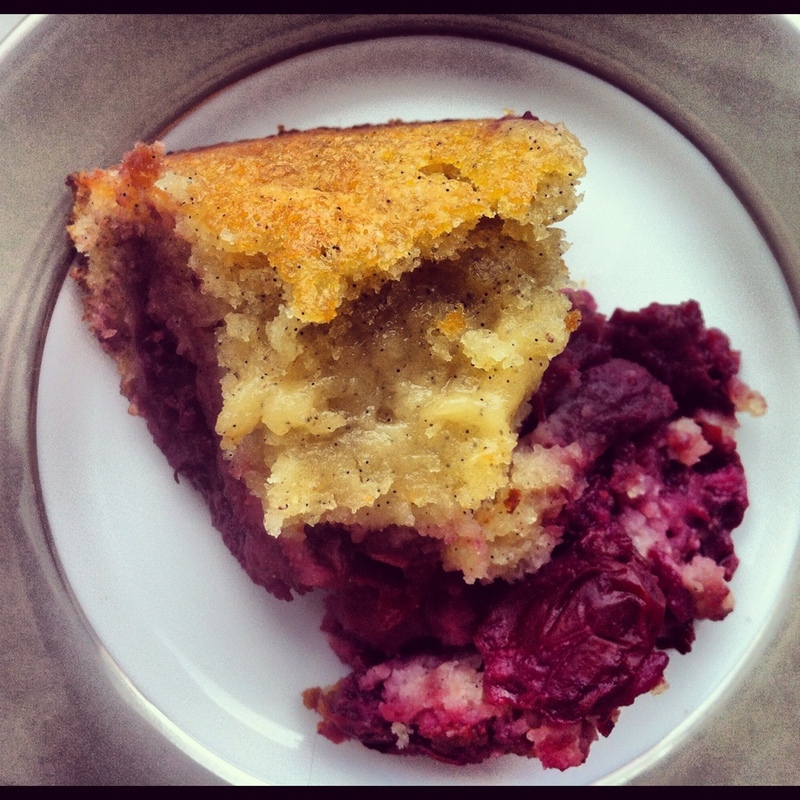 To serve, drizzle some of the remaining cherry juice over top of the cake, and serve with whipped cream. Things didn’t go as planned? That has happened to me before when making an upside-down cake. 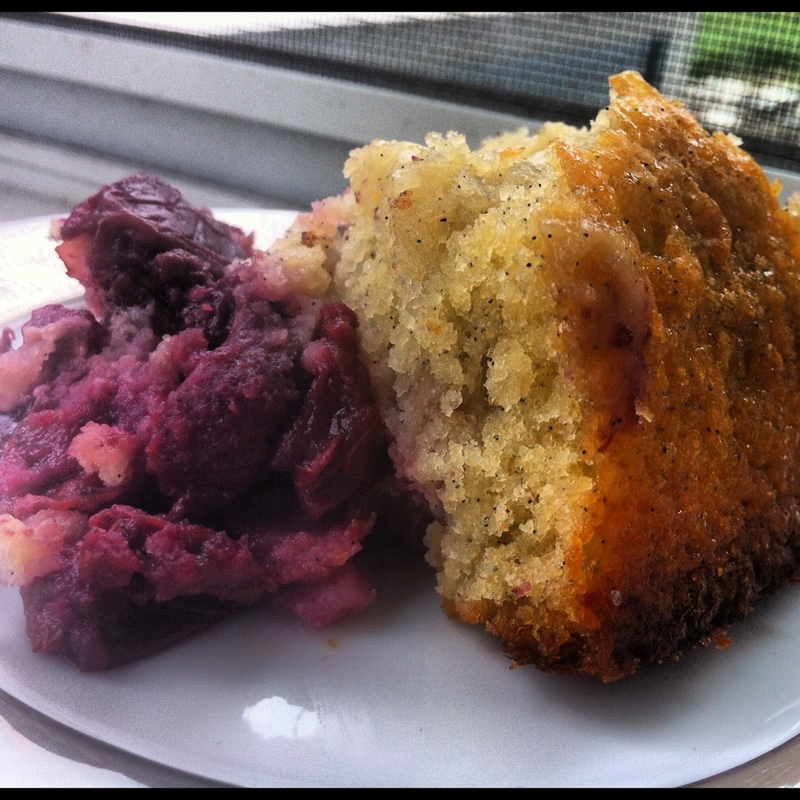 It seems like it should be so easy, yet things can quickly go wrong when you use a different-sized pan than usual, it’s really hot outside, or you just forgot to leave enough time for the cake to cool before you need to leave for the party. The last time I made this, the center totally collapsed on me! Luckily, the rest was edible and I concealed the sunken middle with whipped cream and cherries for presentation’s sake, but if a similar cake disaster ever strikes you, here is a great resource for fixing things quickly. I found this awesome blog post on Vegetarian Times the other day. Have you wanted to get on board with the green smoothie trend, but feel skeptical that anyone would really want to drink that? Or you’ve tried to make one, but weren’t really sure how to make it taste more sweet, and less…well…green? KNOW YOUR GREENS If you want to create a delicious green smoothie, it’s important to choose the right greens. You can’t go wrong with spinach, kale, collards, chard (rib removed), beet greens, and romaine. If you’re new to green smoothies, start with the milder tasting greens like spinach and romaine. Some herbs are also delicious in smoothies. Try cilantro, mint, basil, or parsley blended in with other greens. Though they are incredibly nutritious, mustard greens, dandelion greens, arugula, and other spicy leaves aren’t the best addition smoothies. Save them for salads, or for your favorite cooked dishes including soups and sautées. ADD THE RIGHT FRUIT To add natural sweetness to a green smoothie, incorporate some in-season fruit. In summer, mango, peaches, pineapple, and berries make their way into my blends. For the perfect smooth texture, always use a creamy fruit like mango, banana, or avocado. Frozen fruit makes it even creamier. LOVE YOUR LIQUIDS I like fruity smoothies, so my liquid base is usually a very juicy fruit like pineapple or orange. When blended, these fruits become the only liquid I need. For thinner smoothies, try coconut water, fruit juice, or almond milk; each makes for a unique smoothie. BULK IT UP For added protein, fiber, and flavor, try bulking up your smoothie to make it a complete meal. Chia, flax, and hemp seeds can be blended into smoothies to add healthy protein plus omega-3 fat. You can also try a spoonful or two of your favorite nut butter such as almond, cashew, or peanut. BLEND IT SMOOTH A great high-speed blender such as a Vitamix will take you to smoothie heaven in no time. If you don’t have one of the more expensive machines, that’s okay: try blending your smoothie longer for the perfect texture. Using frozen fruits will help prevent the smoothie from warming up during the blending process. I don’t have a fancy blender — just a nice, sturdy Cuisinart — and it works fine for even green smoothies. I always blend until it’s smooth, and keep tons of frozen fruit on hand so I don’t have to use ice or deal with a lukewarm result. Want more smoothie recipes? Here’s my collection, including this tasty banana-spinach smoothie that’s just the right balance of sweet & green! This and this are the two smoothies I make most often for myself, and Mark (whose birthday is today!) loves this one for post-workout recovery. I’ve mentioned this before: working out while pregnant is critical. But it isn’t always easy, between heartburn, nausea, a sore back and the increasing clumsiness that plagues us all as we get bigger. No matter how in shape you were before getting pregnant, you won’t be able to do everything once baby is on board. Eventually, it won’t be medically safe to lie on your back, or risk abdominal injury by kick-boxing or falling off a road bike. As important as it is to stay fit and strong, it’s even more important to listen to your body & respect your limitations. I exercised zero times during my first trimester because I was so ill, so I really wanted to make up for it once my morning sickness faded from non-stop to every couple days around week 18-19. FitPregnancy has tons of helpful exercise tips and routines on their website. I tested the waters with Zumba until jumping around felt too uncomfortable, and have been walking very consistently (read more about why walking is the perfect pregnancy cardio). I was super lucky to have a family member who is a certified personal trainer devise a custom workout for me, which adapted squats, planks and lunges to accommodate a growing belly. I combined this routine with prenatal yoga, both in class and at home, and I followed the Tracy Anderson Pregnancy Project, a DVD set featuring different videos for each month of pregnancy to keep you safely toned and strengthened for labor. I totally agree with her assessment of Old Navy’s maternity workout wear. It’s affordable, made of great-quality fabric, and grows with your belly while providing a nice level of support for your growing chest. Below is my favorite top, which I’ve been wearing with regular cotton yoga pants or maternity leggings for all my workouts. I highly recommend the full-panel active-wear bottoms by Destination Maternity (like these, which I got cropped), and I’ve also been loving these Victoria’s Secret yoga pants. The fold-over waist has grown with me from my first trimester through the third, and I expect I’ll just about wear these into the ground once baby girl arrives later this summer. What’s great is that you can throw them into the washer and dryer, and these days I’m all about low-maintenance clothing. As for maternity leggings, Old Navy makes my favorite pair — so comfortable and flattering. Ahhhhh, triangle pose: the only thing that relieves my low back pain. Want more ideas? I’ve pinned fitness tips, prenatal exercise videos & outfit inspiration to my fitness and maternity fashion boards on Pinterest. If you have ideas for staying fit while preggo, please share in the comments below or follow me on Pinterest so we can swap!